Morphine use has increased tremendously over the past decade. Although it has a number of medicinal purposes, long term use, in high doses can be very difficult and painful to stop. 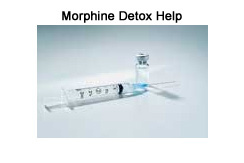 Many people try to turn to morphine detox treatment as a solution to stop using. Morphine is an opiate narcotic pain reliever and works to block receptors in the brain and spinal cord to decrease pain and give a sense of euphoria. Morphine is used to treat pulmonary edema and has a sedation effect. Combining morphine with alcohol and other drugs is not encouraged as it can have an adverse effect and become life threatening, even deadly. Long term use of morphine can result in physical dependency. Brain function may be permanently altered from prolong use and misuse. A tolerance develops with prolong use which requires more of the drug to produce the same effect. Impaired physical and mental ability and a reduction of the level of consciousness are a result of chronic use. Women, who use morphine while pregnant, put their baby at risk for dependency and withdrawal symptoms. Side effects from morphine use include dizziness and drowsiness, nausea and vomiting, loss of appetite and weight loss, sweating, aching and stiff muscles, confusion, mood swings and agitation. In addition to the general side effects from morphine use, the more serious side effects are breathing problems, irregular heartbeat, vision problems, hallucinations and seizures. Withdrawal symptoms from morphine include nausea, sweating, chills, watery eyes, insomnia, diarrhea, runny nose and yawning with more severe withdrawals experiencing psychological and emotional trauma, high blood pressure resulting in stroke and heart attack. Morphine withdrawal symptoms can last up to a few days. Medical professionals have come to note that the best form of detox is IV therapy medical. This form of detox is both safe and effective. The detoxification is carried out through IV therapy which especially important because it allows the doctors to adjust your medication for an immediate effect to manage your withdrawal symptoms and to keep you comfortable throughout detox. These are often extra safety precautions that are not found in standard detox clinics. You can be assured that IV therapy can help you safely detox from morphine and you will not leave with a replacement medication. Often detox programs will give someone a continuing prescription to a drug that they using to help them detox, but was not completely out of their system before they left. A common replacement drug is suboxone. This practice is known as replacement therapy medication and is not an effective form of detox. Freedom Model Retreats can help you rebuild your life after morphine detox treatment. Our educational cognitive behavioral program will help you make different choices that led you to morphine use and teach you to develop different, more fulfilling habits and behaviors. Through discovering and developing different behaviors, you will find a way to build a new life that is free from morphine use permanently.